Performers include: Mireille Enos, Joel Kinnaman, Billy Campbell, Brent Sexton, Eric Ladin, Jamie Anne Allman, Kristin Lehman, and Michelle Forbes. Set in Seattle, this TV series initially connects three different stories as they relate to the murder of a teenage girl named Rosie Larsen; the detectives assigned to the case, the victim’s grieving family, and the politicians involved in a hotly-contested Seattle mayoral race. A smart and competent cop, Sarah Linden (Mireille Enos) is a homicide detective with the Seattle Police Department. She’s a silent watcher who takes in everything without ever revealing her hand. She’s also a distance runner and a single mom to whom motherhood doesn’t come naturally. Determined to have a normal life separate from the daily horrors of her job, Sarah is ready to walk away, marry her fiance, Rick Felder, and move her child and her life to Sonoma, California. However, the murder of Rosie Larsen could be the case that changes her life, and her determination to catch Rosie’s murderer becomes a compulsion. Sarah’s partner on the case is Stephen Holder (Joel Kinnaman), a former narcotics detective who feels right at home in the grit and ugliness of undercover work. He’s just been promoted to Homicide, where he’s a fish out of water. His boss, Lieutenant Oakes, chides the detective for his shabby attire and considers him incapable of the delicate maneuvering the Rosie Larsen case requires, but despite his inexperience the detective’s dogged style complements Sarah’s measured approach. Lieutenant Michael Oakes (Garry Chalk) is their boss at the Seattle police department. Oakes assigns Sarah to the Rosie Larsen case on what is supposed to be Sarah’s last day on the force. When Rosie’s body is discovered in a car belonging to mayoral candidate Darren Richmond’s campaign, Oakes convinces Sarah to remain on the job for a few days longer because he believes her replacement, Stephen, isn’t capable of the “delicate maneuvering” the politically sensitive case requires. Darren Richmond (Billy Campbell) is the president of the Seattle City Council and is running for Mayor. He gives every impression of being “Seattle’s JFK.” Richmond is carrying on a relationship with Gwen Eaton, his campaign advisor — a relationship he is keeping under wraps until the election is over — but still longs for his wife who passed away years ago. He is the type of politico with potential on the national scale, a man of principle and unshakeable beliefs amidst a political world swimming with sharks. In addition to being Darren’s campaign adviser and lover, Gwen Eaton (Kristin Lehman) is the smart, sophisticated, and ambitious daughter of a senator. Jamie Wright (Eric Ladin) is Darren’s brilliant campaign manager. A policy wonk and loyal sidekick, Jamie is focused on the political battle 24/7 and chafes against his boss’ indiscreet relationship with Gwen. He’s a master chess player and strategist, and a valuable — if deeply opinionated — asset to the Richmond campaign. A blue-collar guy, Stan Larsen (Brent Sexton) is the husband of Mitch Larsen and the father of three; Rosie, Tom, and Denny. He grew up in a rough neighborhood, and as a young man provided muscle for Polish mobster Janek Kovarsky. After becoming a father, Stan transformed his life from boozer, brawler, and gambler to family man and owner of S.A. Larsen Moving and Storage, which he runs with his friend Belko Royce. Hoping to provide his family a better life, Stan secretly purchases a home in the suburbs, but after Rosie is murdered he is unable to keep up the payments and turns to Kovarsky for help. Stan’s wife Mitch (Michelle Forbes) is a girl from the wrong side of the tracks who found peace as a housewife and mother. She raised Rosie to be more modest and accomplished than other girls her age, though after Rosie’s death, both Stan and Mitch’s sister, Terry Marek, wonder if Mitch’s strict approach didn’t drive Rosie to live a secret life that led to her murder. Terry (Jamie Anne Allman) is Mitch’s younger, party girl sister who spends her nights hanging out in bars and clubs. While the Larsens mourn Rosie’s death, Terry picks up the slack around the house, including looking after her two young nephews. Even though she means well, she often says all the wrong things. Belko Royce (Brendan Sexton III) grew up in the same neighborhood as Stan, a lost boy type who gravitated to Stan’s natural leadership and, eventually, his loving family. Belko is fiercely loyal to the Larsens and spends most of his time helping Stan with the moving company and being an unofficial uncle to the Larsen kids. Regi Darnell (Annie Corley) is Sarah Linden’s social worker, the woman who guided the young Sarah during her years in foster care and who witnessed first-hand how Sarah’s obsession with an earlier case nearly lost her custody of her young son, Jack. When Sarah delays her move to California to pursue the Larsen case, she and Jack move temporarily onto Regi’s boat. Rick Felder (Callum Keith Rennie) is Sarah Linden’s fiance. Deeply in love with Sarah, he’s anxious to create a new life with her and her son Jack in Sonoma, California. Rick takes the delay in stride but becomes increasingly uneasy as Sarah continues to remain in Seattle. The relationship of Holder and Skinner spirals out of control as the partners are confronted with the shocking truth of the Stansbury murders. First aired: August 1, 2014. 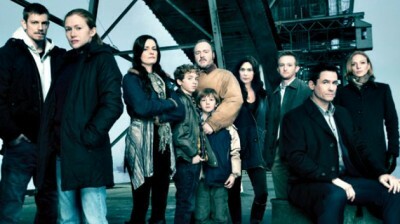 The Killing: Does the AMC Series Deserve a Fourth Season? The Killing: Should “What I Know” Be the Last Episode? One of the best shows ever. Great creative job done by the whole team. Congratulations. I really really enjoyed it. I just watched all seasons of The Killing. I was hooked on this show and let down when it was over. Great series, wish there were more to watch. AMC….Bring back The Killing! why do you cancel smart shows and keep the crap. I am disappointed that you let it go. comments, so is that why you cancel it? Bring it back! Its intelligent and dark; good representation of dissmal life in the streets. Linden and Holder ; dynamic duo! enjoyed the series, Hope they bring it back for another season. My husbandand I watched the Killing faithfully. We both enjoyed the series. Although I wasn’t crazy about the dreary atmosphere of Washington State rainy weather, we thought it complimemted the story line to some extend. We were looking forward for the next case bringing back Sarah to team back up with Holder.